The Best Food for the Best of Friends! 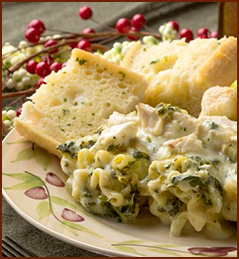 Make your own creation with a selection of different pastas, (spaghetti, tri-colored rotini, cheese filled tortellini), meats included are Tuscan chicken grilled chicken strips, Sweet Italian sausage, beef and pork meatballs. And sauces include (cheese alfredo, bail-garlic marinara and basil pesto) Accompanied by freshly shaved parmesan cheese, toasted garlic bread a Caesar salad with Caesar dressing, balsamic vinaigrette, croutons, and grape tomatoes. Baked Cookies Served with freshly brewed Ice Tea, Lemonade and water. All service ware, including plates, cutlery and glass come with catering. * Ask about our gluten-free options. Pasta bakes that include, Beef Lasagna layered with ricotta, mozzarella, ground sirloin and marinara sauce. Chicken- Spinach Alfredo Penne pasta bake, grilled chicken, creamy alfredo sauce, baby spinach, roasted red peppers, parmesan cheese and penne pasta, Spiral Tri-colored pasta, with baby spinach, grape tomatoes, red, green and yellow mixed bell peppers, garlic-mushrooms, basil pesto and shaved parmesan cheese. accompanied by freshly shaved parmesan cheese, toasted garlic bread a Caesar salad with Caesar dressing, balsamic vinaigrette, croutons, and grape tomatoes. Baked Cookies Served with freshly brewed Ice Tea, Lemonade and water. All service ware, including plates, cutlery and glass come with catering. * Ask about our gluten-free options. 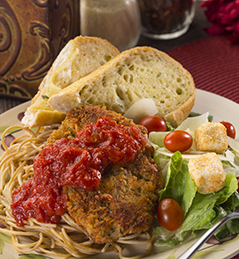 Breaded Chicken Parmesan cutlet, served with Fettucine noodles, basil-garlic marinara sauce, accompanied by freshly shaved parmesan cheese, toasted garlic bread a Caesar salad with Caesar dressing, balsamic vinaigrette, croutons, and grape tomatoes. Baked Cookies Served with freshly brewed Ice Tea, Lemonade and water. All service ware, including plates, cutlery and glass come with catering. * Ask about our gluten-free options. An assortment of our house made pizzas featuring a variety of crusts, thin flat bread traditional white, Good Grains made with whole wheat, flax seeds and oats, topped with a variety of sauces ( traditional pizza sauce, alfredo, basil-pesto, roasted garlic, ranch dressing, gluten-free bbq sauce) Then we put on 100 % milk mozzarella cheese, and have lots of toppings that include pepperoni, ham, Italian sausage, grilled chicken, Italian Salami, Ground Beef, meatballs, tomatoes, black olives, Kalamata olives, mixed bell peppers, garlic-mushrooms, red onion, fresh basil, pineapple and more. Create your own combinations or let us select for you. Typical order allows for 2 slices per person. Caesar salad with Caesar dressing, balsamic vinaigrette, croutons, and grape tomatoes. Baked Cookies Served with freshly brewed Ice Tea, Lemonade and water. All service ware, including plates, cutlery and glass come with catering. * Ask about our gluten-free options. © 2014 Madwire Media. Powered by: Restaurant Marketing 360®.